Thanks to Monchocho I was able to find out about a new game that is soon to be released by Club Penguin in July. This new game is called SoundStudio and you are able to make your own music and share it with others in the Dance Club. From what I've read, you'll be able to create your own unique music, share it and other penguins will be able to like your creation. Not sure how Club Penguin will do this if there are too many people trying to play their music. 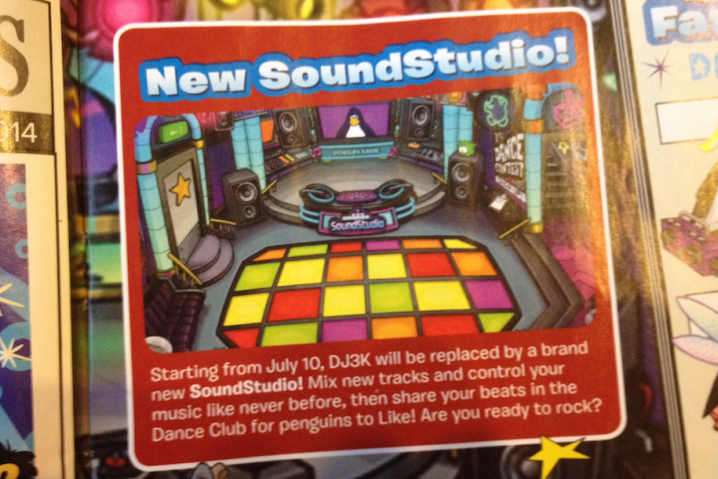 "Starting from July 10, DJ3K will be replaced by a brand new SoundStudio! Mix new tracks and control your music like never before, then share your beats in the Dance Club for penguins to Like! Are you ready to rock?" It would be cool if you could make your music play LIVE so everyone is hearing it at the same time. Although I'm not sure if that would work in rooms that are full.